Health sector buildings cater for a range of functions, that often change over time, and therefore flexibility and adaptability are essential characteristics to facilitate future re-configuring. 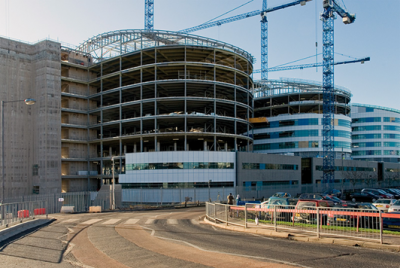 On existing hospital sites, fast construction, generally taking advantage of off-site manufacturing is preferred, to minimise disruption to the hospital. Other important design requirements for many health buildings include noise and vibration control in sensitive areas such as hospital theatres. Many health buildings require a high level of servicing and therefore the distribution and integration of services within the structure are important design considerations. The health sector is committed to procuring and operating sustainable healthcare buildings, which places particular environmental requirements on many schemes. Steel construction enables designers to meet these diverse requirements efficiently and cost effectively. Increased speed of construction, reduced waste and improved quality are achieved due to the off-site nature of steelwork fabrication. Not only is steel a clean, reliable, quality assured product, it also provides solutions that successfully meets strict NHS requirements for acoustic performance and reducing sensitivity to floor vibrations. The time-related savings can represent 3 to 5% of the overall hospital project value and are crucial in the decision-making process for major projects. Long-span steel construction creates column-free space and allows internal partitions to be configured on the floor plan to meet the current and future needs. Shallow floor systems can provide a ‘flat’ soffit without down-stand beams and permit complete flexibility of layout of internal walls. Light steel internal walls can easily be relocated, leading to fully adaptable buildings to meet future needs. Painted steel surfaces can be easily kept clean, free from dust and contamination. Steel construction can be designed to achieve high levels of acoustic insulation and low vibration response to meet stringent NHS requirements, without compromising structural efficiency. Services represent up to 30% of the completed building cost and effective integration of services is important in order to achieve economies. Long-span cellular beams provide for freedom of service distribution and major ducts can be located through elongated openings. Where the service provider can influence the initial design (as is usually the case in PFI projects), services can be distributed efficiently below down-stand beams. 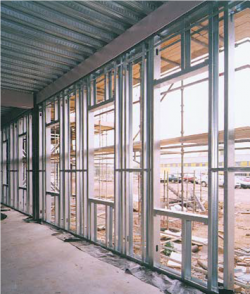 Light steel infill walls can provide a high degree of thermal insulation. The insulation material is placed outside the steel frames to create a ‘warm frame’, which reduces thermal bridging. 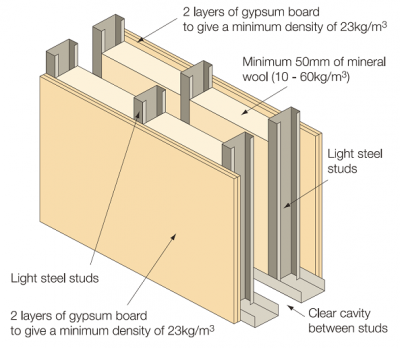 A variety of cladding materials may be used to provide additional insulation. Steel structures are resource efficient. Waste is minimised and can be recycled multiple times without any degradation in terms of properties or performance. Current recovery rates from demolition sites in the UK are 99% for structural steelwork and 96% for all steel construction products – figures that far exceed those for any other construction material. The sustainability attributes of steel construction enable health buildings to achieve the highest BREEAM ratings. The health sector comprises a range of building types including hospitals, health centres, diagnostic and treatment centres, GP surgeries, etc. which can vary significantly in terms of form, scale, layout, etc. In all healthcare buildings emphasis is placed on flexibility, ease of access, suitably sized spaces, welcoming and friendly environments and user satisfaction. Building design is therefore focused on patient experience and community needs. The principal requirements of healthcare buildings are to facilitate the efficient delivery of quality healthcare and provide a positive environment for speedy patient recovery. Whole life cost and value are also important considerations. Health sector buildings comprise a wide range of scales and functions, and therefore various structural solutions are possible from multi storey hospitals with dedicated operating theatres, specialist facilities, and open plan reception space to a local surgery or medical centre with only a few examination rooms. In terms of structural solutions, hospital buildings share many of the characteristics of multi-storey commercial buildings. The structural framework is conventionally on a 7m to 9m grid. Improved future flexibility can be achieved by the use of long-span beams. Long span solutions are also attractive in hospitals, because services can be integrated within the structural zone and pass between and through down-stand beams. In heavily serviced areas Shallow floor systems can be used to minimise the structural floor depth. In contrast to other building types, the efficient layout of healthcare buildings and the location of complex functional or specialist spaces are essential to minimise unnecessary patient travel, to increase productivity of the facility, and to improve circulation. 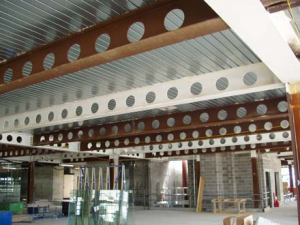 Steel beams with multiple circular openings (cellular beams) for larger multi-storey hospitals in which the adaptability of space use is the controlling factor. Spans up to 18m are readily achieved. Steel construction building systems offer a variety of solutions for health care building design to cater for different needs associated with particular projects. Steel composite floor systems create conduits for services and ventilation as well as achieving good acoustic performance. Light steel walls and modular construction allow for speed of installation and flexibility of design. The following steel systems offer adaptable and flexible solutions to designers. 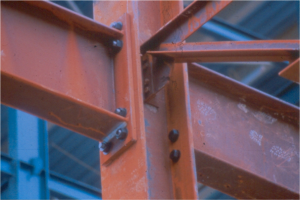 Simple construction is the more common name for structures, where the beam-to-column connections are assumed to be pinned and the horizontal forces are resisted by a system of vertical bracing. Braced frames are a form of construction that is well established in the UK and accommodates a number of different floor systems up to 18m column spacing. Bracing can be in the form of X bracing using cross-flats that can be incorporated around building cores and in brickwork cavity walls. Alternatively, K or V bracing may use hollow sections, and can be efficient where used around windows, etc. Where stability cannot be provided by bracing, continuous frames can be designed in which the beam-to-column connections resist bending effects induced due to horizontal loads. This is an economic solution for 1 to 3 storey buildings with highly glazed facades which have limited areas for locating conventional bracing. Composite construction is commonly used in the health sector due to the speed of construction and enhanced structural economy. The basic principle of how it works is the interaction of profiled steel decking with an in-situ reinforced concrete topping. In composite slabs, the steel decking acts as permanent formwork and, after the concrete has gained strength, provides sufficient shear bond with the concrete for the two materials to act compositely. In addition, the decking provides a safe working platform during construction and provides for diaphragm action so that no horizontal bracing is required. Composite beams are hot rolled or fabricated steel sections that interact compositely with the floor slab by shear connectors attached to the top flange and welded through the steel decking. 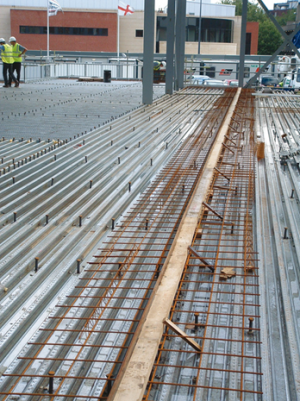 Relatively light mesh reinforcement is placed in the floor slab. Down-stand beams acting compositely with the slab through welded shear connectors, provide excellent stiffness and economy in use of materials. For normal design, beam spans up to 18m are achievable using standard rolled steel sections. 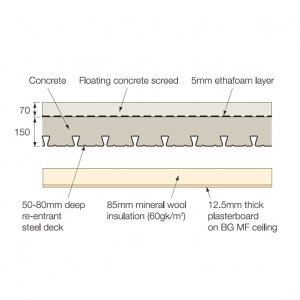 Composite slabs normally use decking of 45mm to 80mm depth to create a 120mm to 160mm deep slab. Deck spans of 2.5m to 4.5m can be achieved without requiring temporary propping, and composite action is sufficiently good that heavy equipment may be supported. Services can be suspended from the soffit of the floor slab. A wide range of long span beams can be ‘tailor-made’ to suit the particular depth and loading requirements of the building. Beams can have parallel flanges or may be tapered along their length, and they can be perforated by circular or rectangular openings (cellular beams). 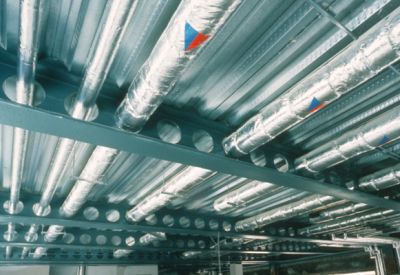 Perforations may accommodate large service ducts, or may be used to minimise the weight of the beams. Spans up to 25 m can be achieved. Apart from their load-carrying function, structural floors are often designed to act as horizontal diaphragms to distribute horizontal forces to the vertical bracing. In the healthcare sector, floor components need to conform with not only fire requirements, but also strict acoustic and vibration limits. Long span composite beams and composite slabs. Lateral loads are transferred through floors to the bracing or shear walls in a building. 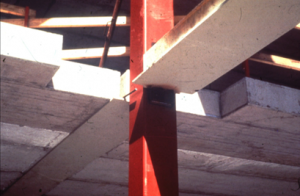 These lateral forces are particularly large in the case of tall buildings and can be resisted by reinforced concrete cores acting as deep cantilever beams fixed at foundation level. Concrete core walls form the enclosure around lifts, stairwell and services. These walls are very rigid in their own plane, which makes them effective in providing overall stability and in minimising deflections. Another function of cores is contributing to building compartmentalisation for the requirements of fire design. In hospitals, the core space is often relatively large because of the need to transport beds and other equipment rapidly around the building. The introduction of cores in low rise buildings is not recommended, as it is less efficient than braced steelwork and may add to the construction time. Light steel infill walls use galvanized steel, typically 1.2 to 2.4 mm thick, roll-formed into C-sections of 75 to 200 mm depth. Separating walls use double C-sections and, with suitable insulation materials, achieve excellent acoustic performance and fire resistance. These walls are lightweight and can be dismantled and moved easily. They create a ‘rapid dry envelope’ early in the construction process, which facilitates installation of services and fit-out. Infill walls are used on the facades or atria to transfer wind loads and to support the cladding. They span between the floors and are attached to them with provision for relative movement at the ‘head’ of the wall. When supporting brickwork, the infill walls provide only lateral restraint and so separate support at the slab edge is required for brickwork more than 12m high (3 storeys typically). Direct support to light weight cladding. Separating walls within the building may be constructed with light steel sections but the steel thicknesses will be reduced because of the lighter loads that they are designed to carry. The same type of construction may be used around lift shafts in braced steel frames. In all cases, these walls can be modified, dismantled, and re-located without affecting the rest of the building. Light steel frames (frames of cold-formed steel sections, of various shapes and sizes) are used in modular units such as plant rooms, toilets and specialist facilities in the health sector. The units are manufactured off-site and are typically restricted to 4m width for ease of transportation. They can be installed using ‘air movers’ to cross completed floors. Modular construction has a strong market in hospitals and specialist medical facilities mainly because of speed of construction and the ability to pre-install and pre-test complex equipment and services. A niche market is in extensions to existing hospitals and particularly single storey roof-top extensions, where modular units are placed on beams that span over the existing roof. In this case, the installation of the modules causes almost no disruption to the operation of the existing building. Modules are generally four-sided but can be manufactured with fully open sides to provide open plan space. In this case, the horizontal stability of the group of modules is very important, and so modular buildings of this type are often low-rise. Spans of up to 12m can be achieved in modular construction. Framework Partnering, Private Finance Initiative and Local Improvement Finance Trust are currently the main routes for the procurement of capital schemes used by the public healthcare system in the UK. For all procurement routes, there is a need to demonstrate that the scheme is viable within the required timescales and provides good value for money. Framework Partnering was first developed as ProCure21 and functioned as such until 2010 when superseded by ProCure21+. Under this framework NHS Clients were enabled to achieve improved levels of performance and value for money than those historically achieved using what is referred to as ‘traditional tendering’. The ProCure21+ National Framework is a framework agreement with six Principal Supply Chain Partners (PSCPs) that have been selected via an Official Journal of the European Community (OJEU) tender process for capital investment construction schemes across England up to September 2016. ProCure21+ is a suitable procurement route for a broad range of work in this sector, and uses the NEC3 Option C: Target cost contract with activity schedule, which requires the principles of ‘open book’ accounting to be applied by PSCPs and their supply chains. ProCure22 replaced ProCure21+ on the 1 October 2016 to provide uninterrupted access. 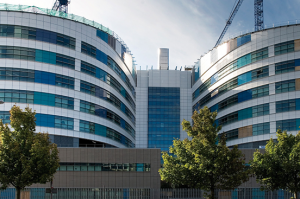 P22 is built upon the successes of these earlier frameworks and will continue to support the NHS to masterplan their estate reconfigurations, carry out extensive maintenance and refurbishment programmes and deliver small and major capital construction work. 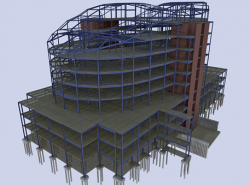 One of the key aspects of P22 is the implementation of Building Information Modelling software on all schemes. The Private Finance Initiative (PFI) is a procurement route established in 1995, and was aimed at introducing private sector resources to develop public sector assets and services. PFI requires private sector consortia to raise private finance to fund projects, which involves investment in assets, and the long-term delivery of services to the public sector. PFI is not normally considered best value for smaller projects as it tends to have high up-front transaction costs and fees. The Local Improvement Finance Trust (LIFT) initiative is a nationally led, locally delivered investment programme bringing the public and private sectors together via a special purpose joint venture company (LIFTCo) - to deliver community based estate solutions. In 2009, following the successful establishment of 47 LIFT companies covering more than half of the population of England, Express LIFT was developed to provide a 'fast-track' procurement route to allow public sector organisations who are not currently in a LIFT area to establish a LIFTCo, with a partner taken from a nationally procured framework of approved partners, without the need for a 'traditional' competition based around the design of sample schemes. At the end of the process, public sector participants will have a partner who will be able to help them finalise the Strategic Services Development Plan (SSDP) and then implement it in a cost effective manner. The creation of a LIFTCo establishes a long term partnering agreement between this company and a range of local public sector organisations. A LIFTCo is a public/private partnership with a focus on delivering support and investment in partnership with the social care economy. Specific guidance on the cost planning of steel framed healthcare buildings is available that builds on the general guidance on the cost of structural steelwork, and cost planning through design stages for structural steel framed buildings by considering the typical design and construction characteristics of healthcare buildings. It explores the importance of programme, the key cost drivers for the healthcare sector and the principal factors to consider when using standard cost ranges to ensure that realistic cost plans are produced during the design and early stages, when a number of frame options may be under consideration. . The construction programme is a key issue on any project, and should be considered together with the cost of the structure, services, cladding and finishes, as the structural scheme will have a key influence on both programme and cost; an optimum solution cannot be reached in isolation. 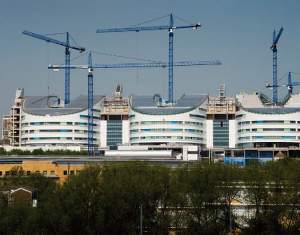 In hospital buildings, the shortest programme is often preferred and is achieved in steel, which will necessitate integration of following trades, usually whilst the steel frame is being erected. The site footprint – can more cranes be physically accommodated on the site? The size of the project – can more than one crane be utilised efficiently? Like all multi-storey structures, hospitals are often erected using a tower crane. Long-span steel systems in which bundles of steel decking are installed by crane are fast to construct and facilitate an early start on servicing and infill walling, etc. Modular services and plant rooms can also be installed at this stage. 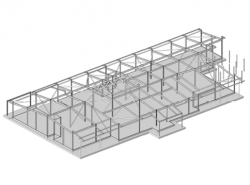 A typical construction programme for a medium size multi-storey steel framed building is shown. 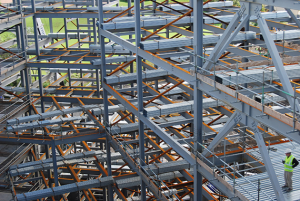 Using steel construction, reductions in construction programmes of 20 to 40% can be achieved relative to site-intensive construction, which lead to commercial benefit to the client by reducing borrowing costs, providing earlier return on the investment and also reducing site management costs (preliminaries). 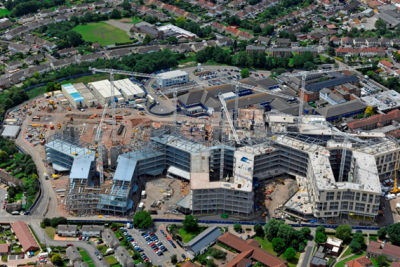 In many hospital projects requiring new buildings on the existing site, minimising disturbance is the key requirement and steel construction is fast, quiet and has few vehicle movements. As a leader of health and social care systems, the Department of Health aspires to excellence in sustainability in healthcare. Sustainable construction matters to everyone involved in the provision and delivery of healthcare services and to all those who use these services. Close local partner and community engagement in the design and development of local healthcare services lie in the heart of ‘sustainable communities’. Following the sustainable drive, healthcare organisations can benefit from a healthier population, improved staff morale and faster patient recovery rates. Steel framed structures routinely achieve the health sector’s sustainability goals. Environmental criteria are addressed, as steel is one of the most recovered and recycled materials, gives flexibility for change in use, can also be dismantled and re-used. Highly optimised use of material, almost complete elimination of waste, low investment costs and optimum operational costs coupled with high quality, functionality, aesthetics and fast construction times account for steel buildings economics. The high proportion of off-site fabrication in steel buildings means that working conditions are safer than for traditional, site-based construction and factory-based steel construction workers are protected from the weather. A fixed manufacturing location means stability for employees helps to develop communities, family life and the skills. Steel buildings releases no harmful substances into the environment and provide a robust, safe solution. Health Technical Memorandum (HTM) 07-07 recommends that healthcare organisations should adopt a life-cycle costing approach. This approach is relevant throughout the building life-cycle, in particular during the project planning, design, construction and in-use phases. Business and financing costs, etc. Health benefits (for example improvements in internal environments). BREEAM is now a preferred environmental assessment method and certification scheme for healthcare buildings in the UK. The Department of Health requires, as part of the project approval and condition for funding, that all new builds achieve an ‘Excellent’ rating and all refurbishments achieve a ‘Very Good’ rating. BREEAM can be used to assess healthcare developments at both the Design and Post Construction stages of their lifecycle. Since 2008 it has been compulsory to undertake a ‘Post Construction Review’ to confirm that the ‘as built’ information correlates with the design information. As part of the national effort to reduce national green house gas emissions, the UK Government was implementing increasingly stringent targets to reduce operational carbon emissions from buildings. For non-domestic buildings, the target was for new buildings to be ‘zero carbon’ in operation by 2019. On the trajectory to zero carbon, emissions reduction targets were to be introduced via Part L of the Building Regulations. However,in July 2015, the UK Government announced that it did not intend to proceed with certain zero carbon schemes, and that energy efficiency standards were under review. It has been widely accepted that it means that the 2019 target for non-domestic zero carbon buildings has been dropped. Nevertheless, health building designers still ought to seek robust, durable but adaptable, low maintenance solutions which aim to minimise adverse effects on the environment both under construction and in use. In order to minimise the CO2 emissions associated with a building, designers should consider the whole life cycle, taking a cradle-to-cradle approach, from building component manufacture, construction through operation to demolition and recycling. The greatest savings in CO2 emissions can be made by optimising the operational energy performance of the building in use. 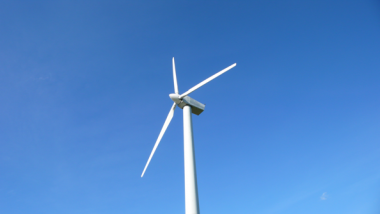 After taking all practical steps to minimise the demand for energy, source the residual energy requirement as far as possible from low carbon or renewable means. Ground linking – geothermal, groundwater, ground linking either for cooling or heating with or without heat pump gearing. 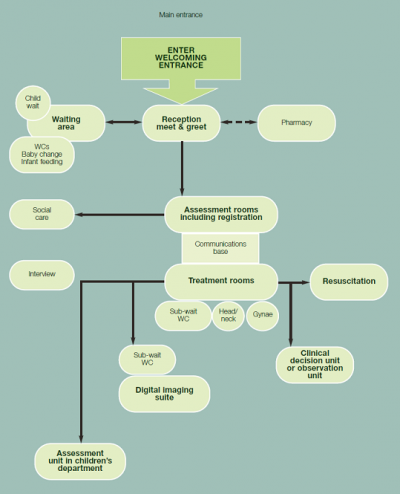 The following application of these technologies is identified in health sector buildings. 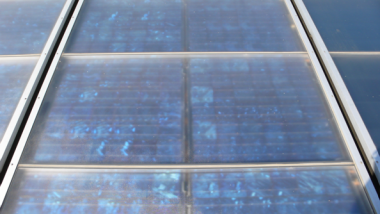 The solar photovoltaic (PV) systems are a reliable, use a widely available resource but rely on a large roof or inclined surface on which the PV panels can be placed in the optimum direction for the sun (generally south east to south west orientation) at an optimum inclination at about 30º to the horizontal. Hospitals have a steady demand for hot water throughout the day, which allows the solar system to maintain optimum efficiencies if solar pre-heating of hot water is included. Solar thermal panels are most effective in raising water temperature from ambient levels (normally 10°C) to 30 or 40°C. In winter, solar-thermal hot water heating panels can effectively contribute to the pre-heating of domestic hot water (DHW). The principal health trust applications for solar thermal heating is the provision of pre-heated cold water via preheat tanks for existing DHW systems and heating for swimming pools and other treatment pools. Biomass includes: wood and forestry residues; recovered wood waste; straw; short-rotation crops (such as coppiced hazel); and poultry litter etc. The design of a healthcare building is influenced by a number of factors, which includes physical issues like surrounding buildings, orientation, site and environmental constraints and operational issues such as care brief, department relationships, circulation and access space, security and infection control, etc. From April 2013, all guidance on health related issues has been available from the individual web sites for England (Search for ‘health building notes’ and ‘health technical memoranda’ to open the full series), Wales, Scotland and Northern Ireland. Health Building Notes (HBN) and Health Technical Memoranda (HTM) outline special requirements for health care buildings. Health Building Notes provide a set of requirements across the range of care and patient experience. Core subjects are subdivided into specific topics. Cross-references to regulations, legislation and other information sources. Health Technical Memoranda cover installation and operation of specialised building and engineering technologies used in the delivery of healthcare. The focus of HTM guidance remains on healthcare specific elements of standards, policies and established best practice. They are applicable to new and existing sites, and are for use at various stages during the whole building lifecycle. Some HTM subject areas may be further developed into topics shown as -01, -02, etc and further referenced into Parts A, B, etc. All of the above documents are relevant for the all-round design of healthcare buildings and their environment however structural designers will be particularly interested in the Acoustics guidance. 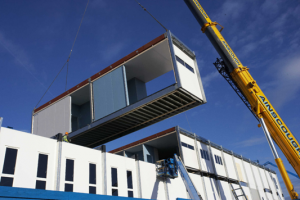 Use of off-site prefabricated service modules. Engineering services in hospitals are becoming increasingly complex with the increased use of information management and technology for patient records, etc. In heavily serviced areas, such as operating theatres and critical care areas, void depths of 1000 to 1200mm are necessary. For less heavily serviced areas, such as wards and outpatient departments (which tend to be naturally ventilated), a void depth of 800mm is generally sufficient, which can be provided by using a mixture of steel frame solutions. In heavily serviced areas, Shallow floor systems can be used, whilst in other areas, cellular beams or composite beams and slabs can provide an effective solution. A major benefit of steel-framed buildings is the early commencement of the services installation and the resulting adequate commissioning period. Increasingly, prefabricated service modules and plant-rooms reduce installation time and the resulting improvement in the quality of healthcare projects. Fire safety strategies in hospitals must recognise that large numbers of people will not be mobile and therefore large scale, quick evacuation will not be possible much of the time. Hospitals are generally designed on the concept of progressive horizontal evacuation, which enables occupants to move away from a fire or an incident to a place of safety on the same level. Occupants can remain within this area until the fire or incident has been dealt with, or await further evacuation to another similar adjoining area or vertically down the building utilising the protected staircases. Other healthcare buildings (or areas such as administrative centres) will operate the principle of full evacuation. Large buildings are divided up into smaller fire ‘compartments using fire resisting walls and floors. Modern hospitals are designed so that on each floor there is a minimum of three compartments limited to 2000m2. There is also a requirement for compartmentation by department boundaries and in high dependency departments, such as operating theatres and critical care areas. An area larger than 750m2 or where the area provides access to more than 30 patients should be divided into sub compartments. Guidance on fire precautions in healthcare buildings is widely available. HTM 05-02, gives guidance on fire safety. It is accompanied by HTM 05-03 specifically dedicated to fire engineering in healthcare premises. The corrosion protection of steelwork in hospitals does have to be considered, but there are no special requirements or considerations over and above those for other types of non-domestic building. Acoustic performance is an important feature for hospitals, as the provision of acoustic privacy is just as important for the creation of an effective healing environment as adequate levels of natural lighting or ventilation. Acoustic performance requirements for healthcare facilities are set out in HTM 08-01. Composite floors and steel frames achieve good acoustic performance. For practical purposes, a screeded floor is normally preferred for hospitals, with or without a suspended ceiling. 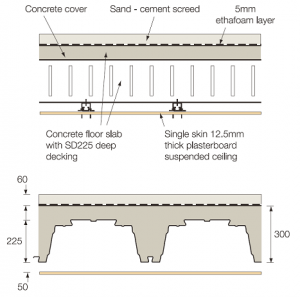 Typical construction involves a composite floor slab using either conventional shallow or deep decking and a 60mm to 70mm sand and cement screed on top, as shown. For improved performance, a resilient layer may be included at the interface between the composite slab and the screed. The resilient layer can be dense mineral wool, plastic insulant or polyethylene foam and should be turned up at the edge of the floor to isolate walls from the screed. Acoustic tests on a wide range of composite constructions have been carried out and some recent results are shown in the table below. These demonstrate that an airborne sound reduction of over 63dB (>52 dB required) and an impact sound level of lower than 45dB (<65 dB required) can be achieved without a resilient floor covering. 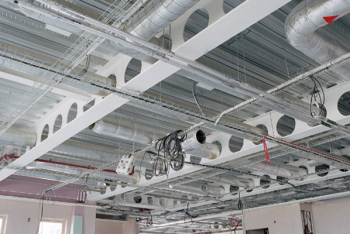 Internal walls in hospitals can be built using light steel construction and separating walls enclosing sensitive areas can be built to a high standard of airborne sound insulation using double leaf light steel construction, as shown. An overall wall thickness of 250mm can be achieved, which is significantly less than in traditional masonry construction. The vibration response of floors is a key issue in the design of hospitals, especially in sensitive areas, such as operating theatres. For floors that are subject to cyclic loading from walking, human perception (and acceptability) of motion is related to acceleration levels rather than displacement; and thus it is acceleration which must be controlled. The evaluation of the exposure of humans to vibrations in buildings is covered in BS 6472. Limits of satisfactory vibration magnitude are expressed in relation to a ‘base curve’ and a series of multiplying factors (sometimes also referred to as ‘response factors’). Response factors appropriate to different types of space in hospital buildings are set out in HTM 08-01. These values are summarised in the table. A series of tests on steel-framed hospital buildings have shown that occupant-induced vibrations do not pose a serious problem for sensitive floors. Tests on operating theatres in steel intensive hospitals have, on average, given an in-situ response four times better than the specified recommendation. SCI P354 is a design guide that covers human perception of vibration and the criteria by which it is measured and accepted. It explains the concepts of floor vibration response. This includes the primary and secondary beam mode shapes (see below), and the different types of excitation produced by occupant-induced vibration. A design procedure is presented, which shows how to calculate floor accelerations, weight them to reflect human perception, and to compare them to the acceptance levels in HTM 08-01. 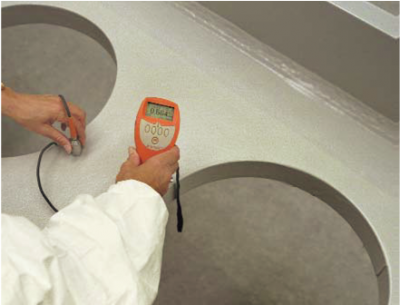 The Steel Construction: Floor Vibration publication is also relevant, and a useful web-based Floor response calculator is also available to swiftly evaluate the vibration response of floors. To demonstrate the ability of steel-framed floors to meet the strict NHS requirements for vibrations, a series of tests have been carried out on a variety of hospital buildings. A summary of the results from tests in operating theatre areas is shown. These results demonstrate the excellent performance of composite construction, which easily satisfies HTM 08-01 limits for vibrations. In addition, numerical modelling using Finite Element (FE) analysis has also been carried out to provide accurate predictions of measured behaviour. 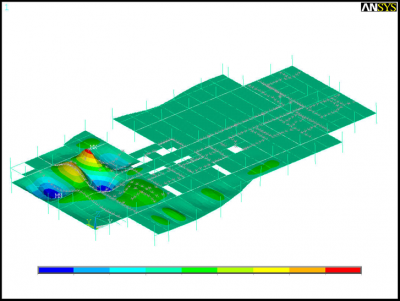 Finite element modelling has been carried out on the shallow floor system for the Diagnosis & Treatment Centre at St Richard’s Hospital, Chichester. These analyses led to significant savings in steelwork and confirmed that the floor met the HTM 08-01 requirements as they existed at the time (2008). A significant feature of the CDM Regulations is that designers are required to address safety of construction processes in terms of foreseeable hazards and take measures to mitigate them. The designer has significant influence on the specification of components, which falls within the definition of design according to the Regulations, and should be given equal attention to that of the construction method itself. The designer is obliged to follow the same hierarchy of measures whether considering the construction process or the specification of components, namely to avoid hazards, reduce their impact, or protect people from their consequences. 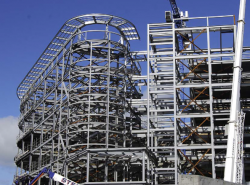 Steelwork contractors are specialist companies who adopt highly sophisticated erection techniques, including installation using mobile platforms (MEWPs). In this case the steel structure is designed to support the temporary weight of the platform which moves along the beams to permit safe erection of the structure on the level above. In healthcare buildings, as in any other steel framed buildings, high quality control and controlled environment of fabrication of steelwork contribute largely to the success of steel as a construction material. Shop assembly relies mainly on welding, which is performed by qualified operatives according to relevant standards and subject to high level of inspection and control. Quick frame erection is particularly important in healthcare buildings. Early decisions made during design and the designers understanding of buildability aspects may significantly increase the ease and economics of construction. ↑ BREEAM UK New Construction, Non-domestic buildings (All UK), Technical Manual, SD5078: BREEAM New construction 2018 1.0. BRE Global Ltd.
↑ Health Technical Memorandum 05-02: Firecode, Guidance in support of functional provisions (Fire safety in the design of healthcare premises), 2015 edition, Department of Health.